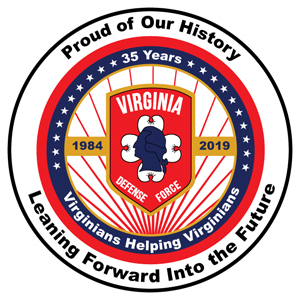 RICHMOND, Va. — The Virginia General Assembly passed Joint Resolution 864 Feb. 8, 2019, commending the Virginia Defense Force on the occasion of its 35th anniversary. VDF history traces back to the Virginia Volunteers in World War I, the Virginia Protective Force and Virginia State Guard in World War II, and the Virginia State Guard was formally reestablished on April 18, 1981, and is recognized as the birthday of the modern VDF. The Virginia General Assembly amended the Code of Virginia March 1, 1986, to change the name of the Virginia State Guard to the Virginia Defense Force. The VDF plans to observe the anniversary at multiple events in April 2019. RESOLVED FURTHER, That the Clerk of the House of Delegates prepare a copy of this resolution for presentation to Brig. Gen. (Va.) Justin P. Carlitti, Sr., on behalf of the Virginia Defense Force members under his command as an expression of the General Assembly’s gratitude for their 35 years of dedication to the citizens of the Commonwealth.